Carl Ludwig Hermann Long was born on 27 April 1913. He studied Law at the University of Leipzig, where, in 1936, he entered the Leipziger Sport Club. After his graduation, he practised the legal profession in Hamburg, though always keeping an eye on the sport. At age 21, in 1934, he won the third place in the long jump in the European Track Championships of Turin, becoming the German nation’s favourite. At the Olympic Games of 1936 in Berlin, sought by Hitler to show the supremacy of the Aryan race, Luz Long matched the stereotyped image of the Aryan man: tall, blond, handsome, a light complexion, blue eyes. He challenged Jesse Owens, US athlete, in the long jump. Owens had already failed two jumps and risked being eliminated. The German instead went to his adversary and suggested him to anticipate his take-off. Encouraged by the loyalty of Long, who had suddenly become his new friend, the American found again his psychological balance and, following his suggestion, he managed to execute the trial properly and achieved his fourth Olympic Laurel – thanks to his last jump of 8.06 meters with which he had outpaced Long, still at 7.87 meters. The German athlete ran immediately toward Owens to congratulate him, giving him a friendly hug. The reporters attending the events immortalized this moment with a photograph that would become at the same time the icon of those Games and the one of brotherhood among the peoples. The friendship between Jesse and Luz was expressed in their later correspondence, as well. 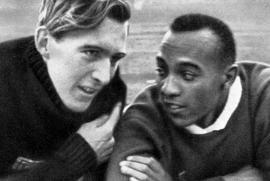 Luz successfully continued his career, so that one year later, in 1937, he improved his personal and national record, and then started training for the triple jump. In the meanwhile, he managed to conclude his Law studies, becoming a lawyer in 1939, he got married in 1941, and he had a child a little later. The war though started turning for the worse for the Reich and the military commands, in dire need to replace the fallen, at the end of 1942 sent Long the call-up notice, mobilizing him into the infantry with the rank as a sergeant major. In 1943, he was sent to Sicily. After four years since his landing, on 14 July 1943, seriously wounded, he was captured by the Allied forces and sent to a British field hospital in San Pietro Clarenza, where the military doctors could do nothing but certify his passing. Only in 1950, the Red Cross found his remnants in the war cemetery of Ponte Olivo, near Gela, to then move them to the one of Motta Sant’Anastasia, where they still are nowadays. In 1942, Luz wrote to Jess from the front: ”Where I am it seems as if there was nothing more than sand and blood. I am not afraid for myself, but for my wife and my baby, who has never really known his father. My heart tells me this could be the last letter that I will write to you. If this were the case, I ask you only this: when the war is over, go to Germany to see my son and tell him that not even war managed to break our friendship. Your brother Luz”.